Blurry Photober kicks off in creepy style, as David and Dave open the door to Black Eyed Kids. A disturbing, eerie phenomenon that has been gaining exposure in recent years, Black Eyed Kids, BEKs, or Black Eyed Children are unknown beings hell-bent on getting inside your home for reasons unknown. 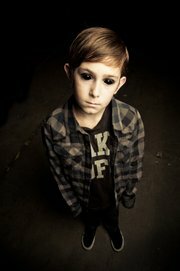 Adding to the dreadfulness of seeing children at your door is the fact that their eyes are solid, glossy black orbs. The boys of Blurry Photos discuss some encounters that people have had with these entities, as well as what the heck they could be. The month to end all months is underway, and the sinister Black Eyed Kids are leading the charge in this podcast episode!